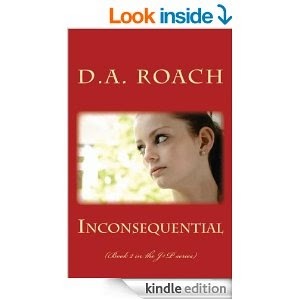 #Inconsequential (Book 2 of J+P series) #ebook will be #free to #download Thursday November 20 – Friday November 21. In Book 2, Perry is beginning her second year of #college. She is excited to see her friends and do her best to get the grades needed to get into the school of Life Sciences. The school is very competitive and her #domineering parents have told her that if she fails, she will be taken out of college and be brought back home. This is not an option for Perry. She also is finding her self in a #LoveTriangle. She struggles with knowing how to have #HealthyRelationships when all she knows is what her #abusive past has taught her. Can she love and be loved? Will it get in her way of a successful school year and her continued freedom from her abusive family?